Pizzanista hosted Mike Vallely a couple weeks back to talk about his infamous “Barnyard Board.” The shape of the deck was seen a precursor to modern street decks, but the Marc McKee graphic also has a story behind it. With the anniversary of the deck, we’ve seen a re-issue on Street Plant Brand, the Servant Collab shoe, and now a pizza box. Mike gives a little more detail to that story (which may have been misrepresented in previous tellings) of the board. Kevin Marks, contributing-editor sent in his account of the evening with the edited video below. We might be hearing from Mike V again soon, so be sure to check back often. 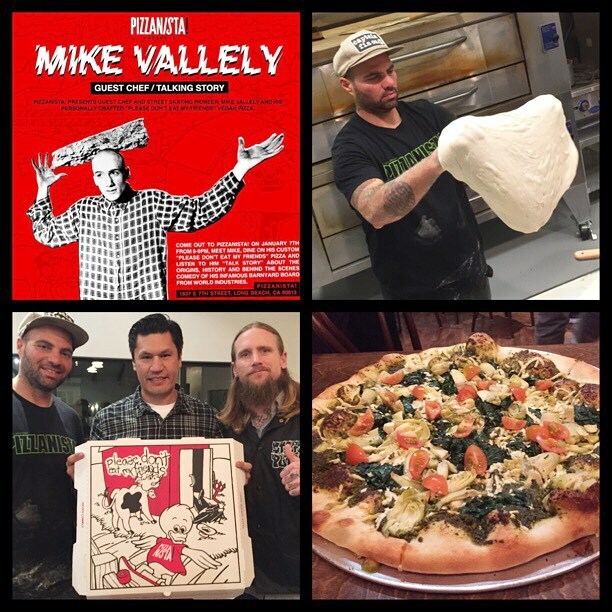 I didn’t see this one coming… but Mike Vallely is vegan along with his whole family. Mike told me last night that 2 years ago he found himself walking through Louisville, KY. He went past a hog slaughterhouse and the noises & smell repulsed him and he then made the decision to not eat animals any longer… as of Sept 2015 he and his family are embracing veganism. That night’s story telling event at Pizzanista was amazing. I came to find out that Salman Agah is a committed vegetarian and sees Pizzanista continuing to break ground on vegan options and less meat. The pesto pizza that Mike and Salman crafted called the “Please don’t eat my friends” was insanely good and Salman is considering keeping it on the menu permanently. Full video of the evening is up on Youtube from Jason Bush. This entry was posted in Activism, ART, Event. Bookmark the permalink.